In Honor Of Design: Take 3: St. Patrick's Day Eats! Take 3: St. Patrick's Day Eats! I may not be Irish, but my husband and son are so I would say I am by default, right? How are you celebrating? Teh story of St. Patrick is awesome, and I think he deserves at least some good party food or drink in his honor! Here are a few I found that I wanted to share with you! Thanks to each and every one of you for your kind words, prayers, and support yesterday! It means the world to me, because I believe prayer is powerful! Also, a huge welcome to all the new readers this week! I hope to be able to keep in touch with you! P.S. I got to be a part of a very fun interview over on Amma's Blog if you have the chance to come visit! 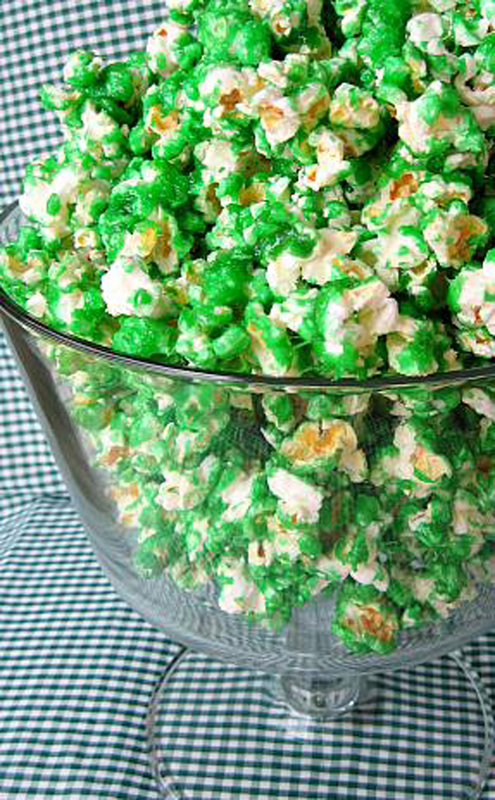 For the Candied Popcorn recipe, Read more below! In heavy saucepan on medium heat melt butter then add sugar, corn syrup, cream of tartar and salt. Increase temperature to medium high and bring mixture to a boil, stirring constantly to dissolve sugar. Once mixture boils, add in food coloring and stop stirring. Boil for 5 minutes (Do not stir). Mixture should be about 250-260 degrees. Remove from heat and carefully stir in vanilla and baking soda. Working quickly and while mixture is foamy, pour mixture over popped corn and gently stir to coat popcorn. Place popcorn into a large roaster or rimmed baking sheet (lined with parchment paper or sprayed with cooking spray) and bake at 200° F for 1 hour, stirring every 15 minutes. happy st patty's day! love all these pictures - but i esp. want those cool straws in the first photo! Looks delicious! Happy St. Patrick's Day! And don't forget... GO CATS! Well, i'm not irish and don't really celebrate - but i love everything green, and that drink in the first picture looks delicious. Maybe i'll try that! Happy St. Pat's to you! 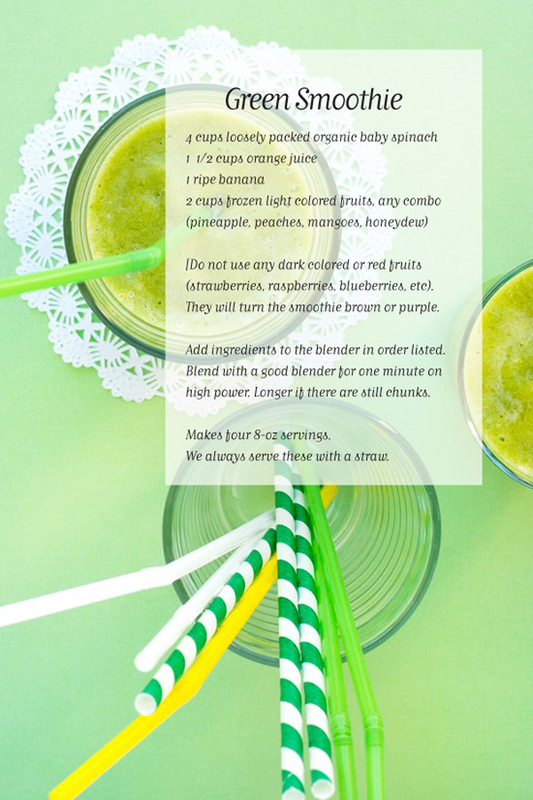 I'm a little bit Irish (probably 1/8th, hehe) so I should be drinking one of those green smoothies today!! I love that green layered cake too - so cute! A fun twist on the layered rainbow cakes! i've been making a lot of smoothies lately with spinach and they are soooo good!! and that popcorn looks yummy too! I want to make that smoothie!! Yum yum!! Wow...those all look so FUN! I think I may need to make that popcorn tonight! I'm not Irish that I'm aware of, but it's still fun to celebrate. I'm loving that green cake, if only I could have a piece! Have a great day today. Also, sorry to hear about your Aunt losing her battle. I've lost loved ones to cancer, much too soon. It's not easy to deal with the loss, so I wish you all the best. i'm ready to dig into a slice of that amazing cake! 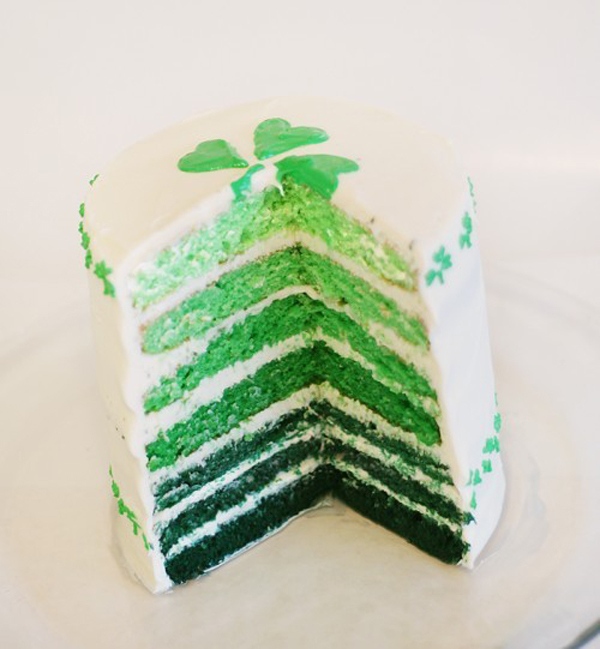 the layers of green in the cake are too great :) happy st pat's day to you! These recipes are a fun and creative way to celebrate a holiday. The layer cake with varying shades of green would be perfect to serve at one of the many parties I host at my home. Thank you for sharing. I need to get started on that green cake. This is an excellent St. Patrick's Day collection, Anna. I'm totally inspired. happy saint patrick's day! Everything looks YUMMY! all looks very yumz especially the green popcorn is just too tempting!